We offer a 24-hour dispatch line seven days a week to ensure that our customers are looked after at all times. As an extra safety precaution, all of our drivers have cell phones so that the drivers can always be contacted. Our insurance coverage is well over the minimum requirements of $2 million in Canada and $5 million in the U.S.A With a $20 million Third Party Liability (bodily injury and property damage coverage). 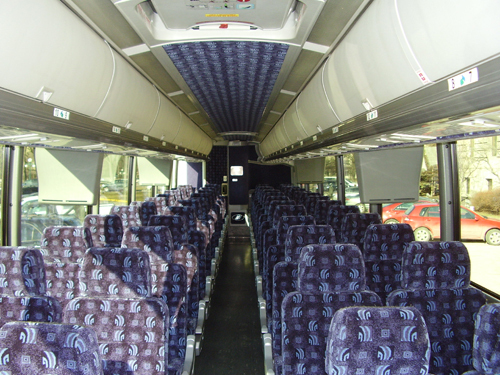 We operate a modern fleet of 16, 40, 48, 54 and 56 passenger MCI and Prevost motorcoaches. 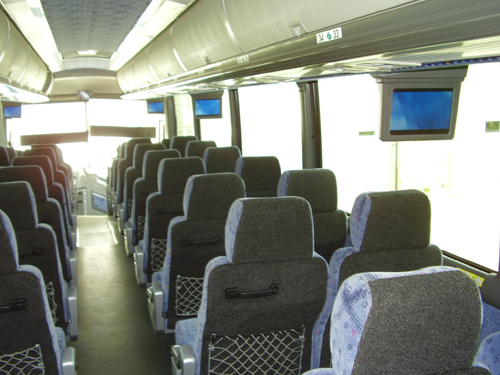 Our motorcoaches are top quality and come equipped with deluxe interiors, reclining seats, enclosed overhead luggage compartments, DVD’s, CD player’s, AM/FM stereos, PA system, 110-volt power outlets, reversible seating with tables, washroom facilities, air conditioning and ample luggage space in the underneath compartments. Our 40-Passenger Lounge Coach has 28 forward-facing seats, a lounge area with side tables and comfortable couches that seat seven passengers, and a card table area in the rear that seats five. 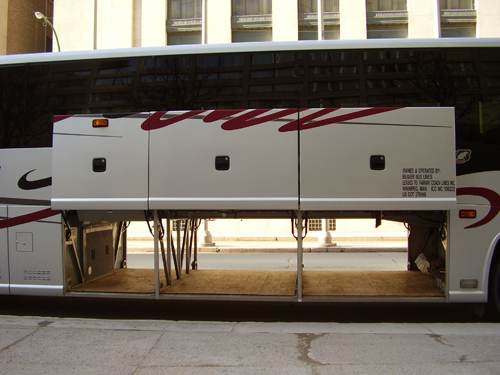 Something unique that we have to offer is a 48-passenger motorcoach where the seats convert to sleeper beds with room for eight sleeping passengers and 32 forward facing seats. The 16-Passenger Sprinter Bus has luxurious reclining leather seats, individual reading lights, 110 volt plugs and USB chargers, as well as a large luggage compartment in the rear. 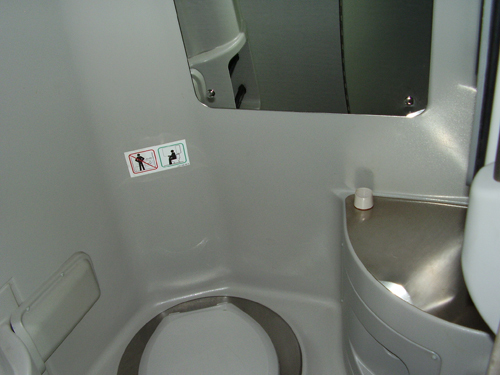 The Sprinter Bus does not have a washroom. 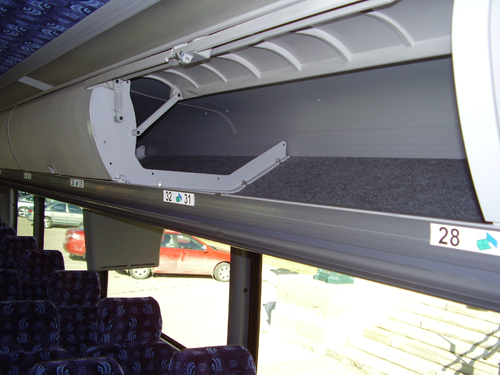 Our transit-style buses have air-ride suspension, air conditioning, comfortable seats, wide aisles, overhead luggage racks and are equipped with a low-entrance step for ease of passengers to board and disembark from the bus. 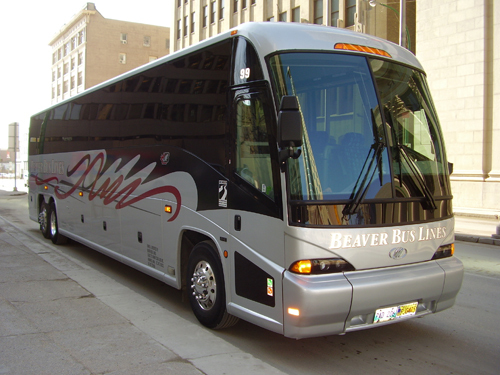 If you have any transportation needs originating out of Saskatchewan, Moose Mountain Bus Lines is our affiliate company and operates a modern fleet of 47-56 passenger motorcoaches out of Regina, SK.